A free monthly series of two-way science conversations where researchers on topics like butterflies, water, politics and Wisconsin’s deer herd will welcome questions. The Tap Talks are slated for 4 p.m. on second Sundays, September 2018 through May 2019. The photo exhibit, “Under the Surface – A Photographic Journey of Hope and Healing,” is currently showing at the Great Lakes Aquarium in Duluth, Minnesota, and will soon be coming to Madison, Wisconsin, or a town near you. Gene Clark, Wisconsin Sea Grant’s coastal engineer, is planning to retire in 2019. Read about his standout accomplishments, which include the Sea Caves Watch Project, the freshwater steel corrosion issue in Lake Superior and the beneficial reuse of material dredged from Great Lakes harbors. We will miss him! The Lake Superior National Estuarine Research Reserve and the Minnesota and Wisconsin Sea Grant programs are starting the sixth year of science café-type evening talks about the St. Louis River Estuary in October. The talk, “Shedding Light on Groundwater,” is scheduled for Wednesday, Oct. 24, 7 p.m. at the Estuarium (3 Marina Drive, Superior, Wis.). The speaker is Kelsey Prihoda, a researcher with the Lake Superior Research Institute at the University of Wisconsin-Superior. 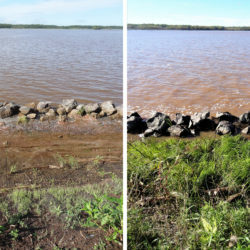 Wisconsin Sea Grant is cooperating with Canadian counterparts to develop guidelines and a network of engineers, known as a community of practice, who are interested in living shorelines for cold regions — and they would like more to join them. Research done by Wisconsin Sea Grant and the School of Freshwater Sciences at the University of Wisconsin-Milwaukee has informed Milwaukee County officials’ exploration of potentially moving South Shore Beach. Research has shown that relocating the beach just 150 meters south of its current spot would significantly improve water quality. In the first swim held in the Milwaukee River in potentially 100 years, 68 people entered the water for a mile-and-a-half race called the Cream City Classic. All but one finished, and nobody got sick. Sea Grant welcomes Dr. Yi Liu, the new J. Philip Keillor Coastal Management-Sea Grant Fellow. Among other duties, she will work on updates to the Coastal Processes Manual. Liu recently completed a doctorate in civil engineering at Virginia Tech. Wisconsin Sea Grant is pleased to announce the three newest recipients of the Carl J. Weston Memorial Scholarship: Loretha Jack, Briana Shea and Chelsea Volpano. The scholarship recognizes talented undergraduate researchers working on Sea Grant-supported projects. A program designed to reduce pollution and protect Wisconsin’s waterways was recently awarded $200,000 from the Fund for Lake Michigan. It’s the Wisconsin Clean Marina Program, which has operated since 2009. The three-year grant will allow for increased staff time and a renewed focus on encouraging more marinas and boatyards in the state to become certified.